beautiful flash of rock'n'roll music." Provoked by the post-Sgt. Pepper's boom of self-consciously mature, album-oriented artistry, Cohn's eve-of-the-1970s nostalgia for the recent past was queerly prescient, anticipating glam rock's retro-futurist resurrection of the three minute single, visual dazzle, the whole teen-scream-dream. What makes Roxy's music on these ultra-vivid sounding remastered reissues so endlessly listenable and so different from the rest of the glitter gang is that they had a foot in both the art rock and Pop Art camps. If the band's pop sensibility was informed by Warhol, Fifties rock'n'roll, and classic Hollywood ("2 H.B" payed tribute to Bogart's poise), Roxy's vision of rock was large enough to encompass Velvet Underground, Steve Reich,Ornette Coleman, Brecht-Weil, and Pierre Henry. The result of such incongruous inputs and clashing sensibilities was, as ex-member Brian Eno noted later, "a terrific tension in the music," which came from "juxtaposing things that didn't naturally sit together". But then success placed Roxy in a position where that "element of clumsiness and grotesqueness" had to go, in favour of an ever more sleek and well-proportioned pop classicism. and Bryan Ferry gradually eliminated. Kickstarting the debut, "Re-Make/Re-Model" is a pub rock brawl that's a notch above Wizzard's crude rock'n'roll revivalism thanks only to the alien qualities of Ferry's Devo-esque whinny, Eno's synth-bleats and Andy Mackay's freeform sax squall. A Number Four smash in late '72, "Virginia Plain" is a glorious Velvets-meets-Neu! surge, with ugly blurts of synth that'd warm the valves of Add N To (X)'s mechanical heart, and that fabulous bit where the song halts then revs up again for its final stampede. Both songs show how glam's back-to-basics manoeuvre anticipated punk's. Other tracks on the debut, though, are basically progressive rock, closer to King Crimson-style maximalism than Velvets/Krautrock minimalism. The multi-segmented "If There Is Something" starts weirdly like The Band in faux-Southern boogie mode (e.g. "Up On Cripple Creek''), before morphing into Euro neuromanticism (Ferry's pledges of amorous fealty climax with the bizarre promise to "grow potatoes by the score"!). After a third section (a keening, ruminative sax soliloquy over weary piano chords), the song glides into a plastic soul coda, complete with Ferry's most bloodcurdling vocal theatrics ever--stricken histrionics wrenched from deep within, at once harrowingly visceral yet somehow utterly un-human. Like some monstrously unwholesome caricature of the love song, "If There Is Something" makes no sense structurally or emotionally, yet it's shatteringly moving. On a similarly non-coherent tip, "The Bob Medley" is approximately six songs in one: Sabbath-meets-Crimson bombast; a Spinal Tap/"Stonehenge" interlude of dancing-dwarf pan-pipes; a musique concrete simulated battlefield; a West Coast hippy-rock sing-a-long; an oboe-accompanied poem, etc. upper octave trills) pointillistically painting a Milky Way skyscape mad with stars. Finally the song expires like a galaxy swirling down a black hole's funnel. Steeped in Eno's studio-as-instrument sorcery but charged with a cryptic passion he's never mustered solo, "For Your Pleasure" is one of the most psychedelic records ever, easily rivalling Barrett-era Floyd, Hendrix, and Tim Buckley. 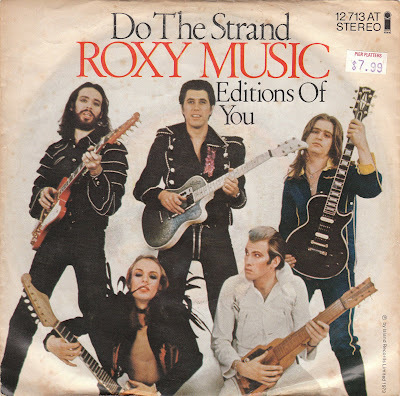 1973's Stranded, Roxy's jutting angularity and experimental excresences have largely been bevelled away. Still, the album is intermittedly exhilirating: the carillion-guitared swagger of "Street Life", the gloss-funk sashay of "Amazona" (cracked apart by an astounding liquid-lightning solo from Manzanera), and "Mother of Pearl", Roxy's last blast in full-on Velvets-mode. The song uses imagery of the gem trade to describe the romantic arc of idolisation and disillusionment; Ferry's character shifts from courtly lover worshipping a "lustrous lady" to jaded misogynist who's discovered that his blue-blooded belle dame is really just a "so-so semi-precious" social climber with a rough-cut past, just like himself. Americans, bless 'em, think Roxy only got great with Country Life and the universally five-star Siren. Wrong! While Ferry's songcraft and personae twists still offer compelling drama on top tunes like "Love Is The Drug", "Both Sides Burning" and "Just Another High", the actual fabric of Roxy's sound gets steadily more conventional and tame. Sonically, Country Life's saving graces are the thrilling blaze of "All I Want Is You" and the Weimar-flavored "Bitter Sweet"; Siren's are excitingly shrill, proto-New Wave tunes like "Whirlwind" (reminiscent of early Psychedelic Furs) and "Both Sides Burning" (Japan). But mostly Ferry is honing his metamorphosis from glamdroid with the Dalek-like metallic vibrato to sad-eyed, fop-fringed crooner. To be sure, it's still a long way from the blandly attractive art-disco and bruised romantic ennui of the late Seventies Manifesto-era Roxy. But it's remoter still from the hair-raising strangeness of For Your Pleasure. From the music's clashing colours to the outlandish clothes, Roxy was a revolt into style. Was glam rock a reaction against the drab rump of hippiedom in the early Seventies, all the folk-rockers, blues bores and boogie bands? the others. It was more a reaction to what came after hippy, this grey doldrum period with bands all wearing denim and making no effort to entertain the audience." Talking of psychedelia, I was surprised by how tripped-out some of the early Roxy stuff was. on me and Eno. If you use echo units, you start to head off into dreamland, and that's what's happening on "For Your Pleasure". We did a lot of stuff using echo, early synths,Revox, treatments, effects. Messing around with sound in a sort of Heath Robinson, mad inventor way!" Bryan Ferry has said sniffy things about Eno, stressing the fact that he's "not really a musician". What was Eno's role, and what changed when he left? "Brian's role was conceptual--he was involved as a non-musician, on purpose. He wouldn't be insulted by that description, he'd love it! He was just an extra colour in the Roxy palette. The chemistry of any unit depends on the individuals involved, and obviously it sounded different after he left. But Roxy had to change anyway, we couldn't have repeated 'F.Y.P'". Alongside the psychedelic edge, it's startling how punky and noisy much of the first two albums were. how we sounded when we played live . FYP and Stranded were produced by Chris Thomas, who'd worked with the Beatles from the White Album onwards, so they had a better mixture of styles." Is Roxy's legacy audible anywhere in the Nineties soundscape? songs that sound a bit like, say, "Do The Strand". But Jarvis Cocker is a unique talent and such a strong personality that ultimately Pulp has a totally different flavour to Roxy."